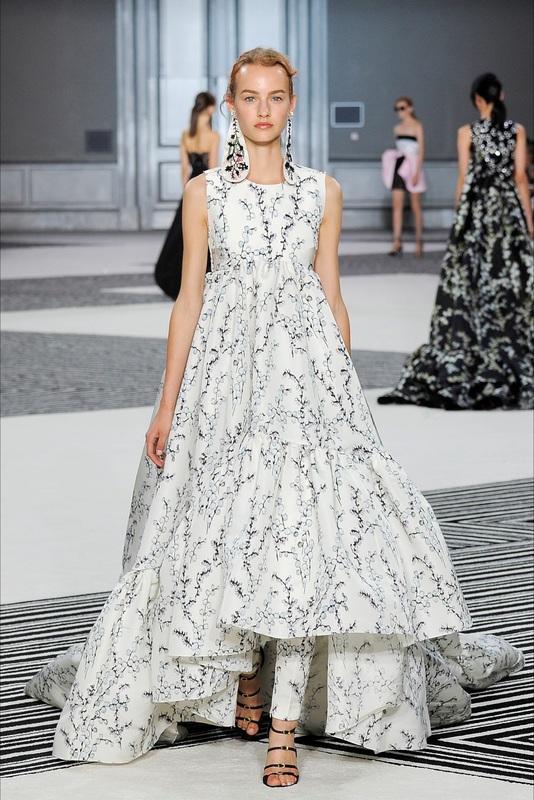 The 49 unique creations by the Italian designer Giambattista Valli are original, delicate and Instagram friendly. The lengths are mini or maxi, with long trains or slits, from short dresses with tulle on the back to maxi robes with flowers applications, from tunics paired with pants embroidered with feathers draped dresses to maxi skirts made of corolla petals in chiffon. Even the accessories can't go unnoticed: warns on strappy sandals with high heels and open toe maryjanes, maxi floral earrings and necklace of crystals. The sunglasses are also huge, with round lenses and Swarovski. The parade of Maison Valli is modern, eccentric and brilliant, just like you would expect from high fashion today.